Firefly Mobile stepped into the spotlight early last year when it joined the Android smartphone competition in the local scene with their Intense 64 LTE. From that point on, it continues to gain traction with their interesting releases. 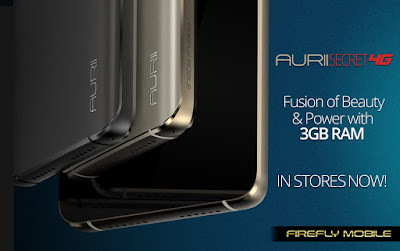 And now, a new device is out in the market to sustain its brand popularity - the Aurii Secret 4G. The Firefly Mobile Aurii Secret 4G sports a 5-inch HD display with IPS and OGS technology, and a Corning Gorilla Glass 3 on top. On the inside, it is powered by 1.3GHz 64-bit MediaTek MT6753 octa core processor coupled with 3GB of RAM and 16GB of expandable storage. Like their recent phones, it is housed in an aerospace-grade aluminum frame. In terms of photography capabilities, the main one at the back is a SONY IMX258 sensor with 13MP resolution, f/2.2 aperture and accompanied by a dual LED flash, while the front facing one got an 8MP f/2.2 module for all your selfie needs. Other notable specs are dual SIM with LTE connectivity, 3450mAh fast charging battery, OTG support, and runs on Android Marshmallow. What is missing though is a fingerprint scanner. It is now available nationwide for a retail price tag of Php5,999 and comes with free tempered glass screen protector worth Php200 and an ARMOR case worth Php400.